General: open_buoy is a modular-design vessel, aimed to monitor water systems and to collect related environmental data. The system can be configured to match different mission tasks, durations and areas of deployment including bayous, rivers, lakes and the ocean. open_buoy is an "open collaboration" project, which means that you can get directly involved in the development of the overall vessel design and/or the development of modules. Why: Broad sensing and monitoring of water systems is needed to predict and document the changes happening within them. open_buoy shall enable this, being a low cost carrier for scientific instrumentation. Status: open_buoy_vers.1 is already build and in a test phase to learn about it`s naval properties. We are currently testing different propulsion systems and electronics for remote navigation and control through a web interface. The next step will be the implementation of sensors to make it collision safe and to talk to the water authorities what it needs to get an official permit for a water “drone”. (To our knowledge no such regulations yet exist). 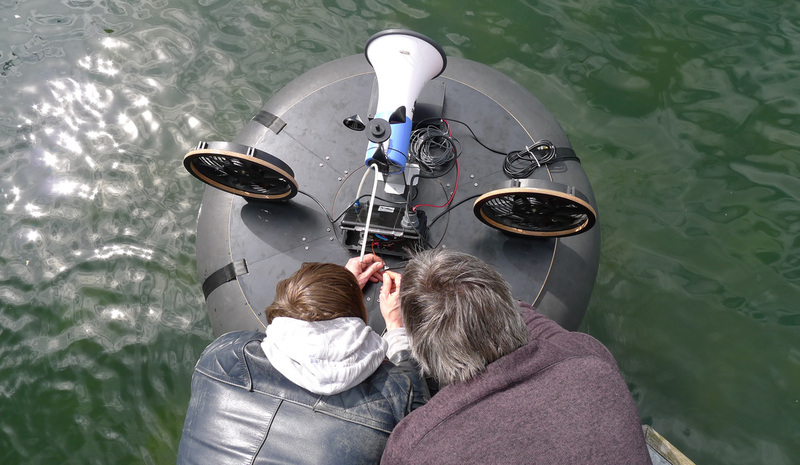 We had a test run in Dublin with a hydrophone and underwater camera on board, a raspberry pie to connect to available wireless networks and some nets attached to collect water samples. The buoy will be in New Orleans wetlands (mississippi-delta) next January/Ferbruary to collect environmental data over a period of 5 weeks. We are now looking into environmental sensors (CTD+water samples and acoustic), under water cameras and balloon-mapping possibilities with an infrared camera, to be equipped for this upcomming mission!